The second issue of Monster Bash Magazine! 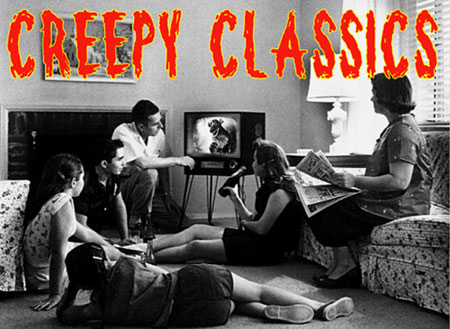 It's back with the fun, rocking articles and photos for classic monster movie lovers. Get ready to head back to the Drive-In for movie memories, look-out - it's Frankenstein's Retribution, An Evening with Karloff, Chandu The Magician, Lionel Atwill, Blob Movies - Get Blobbed, The Gorilla Men, 8mm Movie Madness, The Creepy Crossword, Mexican Gill-Man movies, THE GIANT GILA MONSTER, 50 Years of the CREATURE FROM THE BLACK LAGOON and much more. Art by Kerry Gammill and Joe Busam. Articles by Jeffrey Barnes, Sam Borowski, Bob Burns, Kevin Surnear, Bob Pellegrino, Roberto Cotter, Charles Henson, Leonard Kohl, Dave Nelson, Barb Heiss and more! Plus rare photos provided by Buddy Barnett, Ron Adams and Bob Burns. Low on stock.